So how often do carpets need cleaning? As lovely as carpets look, they do collect all manner of dirt and germs. Dirt, sand, dust, pet hair and anything else that is brought in from outside on the bottom of shoes. They also absorb odours and smells with ease. Things such as smelly socks, cat or dog urine, and other nasty smells are contained in carpets and contribute to making them unhygienic. What’s more, these deposits encourage mite and bugs to make their home in your carpet and increase their numbers as they breed. All of these elements can be easily removed by an experienced professional carpet cleaning company with knowledge of all types of carpets. For a family with 4 to 5 members, we’d recommend at least one clean per year. If you’ve got small children or pets then we’d suggest that every six months might be a better option. Most professional carpet cleaning companies recommend a deep carpet clean at six monthly intervals or once a year. It depends on how much use the carpet gets. Not only is more frequent cleaning costly, but it can cause deterioration of the carpet fibres. An experienced carpet cleaner can advise you on the frequency necessary once they have taken a look at your carpet. 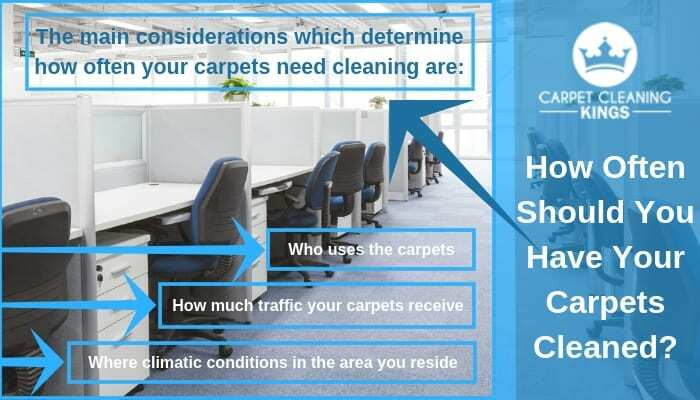 Why use a professional carpet cleaning company? Professional carpet cleaning companies have both the manpower and the right equipment to clean large areas of carpet with hard to remove stains, plus they can also sanitise them. Having the right facilities means the job is done quickly and efficiently. In addition, by hiring a professional, it means there is minimum disruption to your business and daily schedule. Not all carpet cleaning companies are created equal. Check that they have experience in cleaning all types of carpets as using the wrong methods and chemicals could damage your home or office carpet. Check their pricing too, as some companies charge a fee per room while others may charge per square metre. Word of mouth is always the best method of finding someone who does a good job, so always ask around friends and family before hiring a carpet cleaning company. If you’re searching on line, then check out any testimonials on their website. We’ve been in the industry for decades and have a wealth of knowledge and expertise in carpet cleaning. Why not call us today on 1300 7000 75 for a quote or to book an appointment. We’ll soon have your carpets looking and smelling like new.